David Miller hits out while playing for Yorkshire in 2012. THERE has never been a better time to watch cricket if you love the crash, bang, wallop of the Twenty20 era. Scores are going through the roof, sixes are raining down like confetti, and batsmen are playing strokes that their forefathers could never have imagined. But with the rise in swashbuckling shots comes the risk that spectators could be injured or even worse. 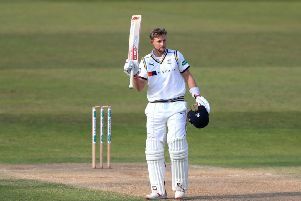 Earlier this month, the former Yorkshire batsman David Miller was involved in a shocking incident in the Indian Premier League when he hit a six for Kings XI Punjab that left a policeman blind in one eye. Aloke Aich, the unfortunate victim, now faces losing his job as a police driver. His son, Rana, said that although the police were covering medical expenses, his father could be forced to retire. Miller, of course, is also a victim. The South African left-hander, who helped Yorkshire finish T20 runners-up in 2012, said: “The incident and its ramifications have been terrible. The question is: can cricket do more to prevent this type of danger? It is one that is only going to grow as T20/one-day cricket evolves. The sport cannot sit back and simply wait for the next tragedy to happen. It needs to take a proactive approach and address this issue of spectator safety. Yorkshire, it will not have escaped your notice, have recently welcomed Glenn Maxwell to Headingley. The Australian all-rounder is one of the most explosive batsmen in the game today; some of the shots that he played during the recent 50-over World Cup were quite unbelievable. But imagine if someone like Maxwell struck a six at Headingley that blinded or even killed a spectator during the T20 Blast. It would be a freak accident, of course, but as poor Aloke Aich and his family could testify, freak accidents do happen - particularly in T20, when not everyone is paying attention. At present, counties receive guidelines concerning pre-game practice routines. Outdoor nets are set up ahead of matches in which big-hitting drills can be controlled. But it is impossible to control what happens during a game. No one knows when the next six is coming – or to where it is flying. Nets could be put up, perhaps, as they are in ice hockey, but how high would they have to be and could spectators still see through them? Spectators could be issued with helmets, but that might also be impractical. The issue needs to be properly debated but one thing clubs could do is to make spectators fully aware of the dangers through regular public address announcements, while spectators themselves need to recognise the risks. As the tragedy in Kolkata proved, doing nothing is not an option.